The register detailed below sets out the list of Manners of risk assessment and management accredited by the Risk Management Authority. If you require any further information in relation to the information contained in this register please contact us. This manner represents a summary of the evidence-based and structured practice process that is variously outlined in RMA Standards and Guidelines. It is based broadly on the research literature underpinning the development of conceptual / theoretically derived methods, and the structured professional judgment approach, and it specifically emphasises the central role of formulation. Its intended outcomes are an individualised formulation that explains the onset, maintenance and occurrence of offending behaviour in order to inform decision making about risk management. This manner shall be used for the purposes of risk assessments conducted by Accredited Assessors under Section 210B and 210D of the Criminal procedure (Scotland) Act 1995 (as amended by the Criminal Justice (Scotland) Act 2003). The manner may also be used by practitioners producing other reports requiring an individualised formulation based risk assessment, e.g. 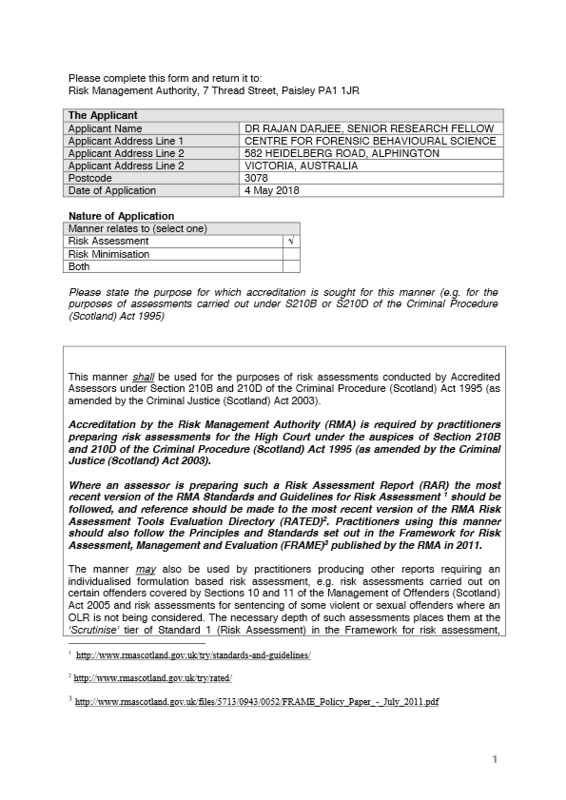 risk assessments carried out on certain offenders covered by Sections 10 and 11 of the Management of Offenders (Scotland) Act 2005 and risk assessments for sentencing of some violent or sexual offenders where an OLR is not being considered. This is an Accredited Manner of Risk Assessment. Accredited Assessors, when appointed by the High Court to produce an Risk Assessment Report (RAR), must use a Manner accredited by the RMA for this purpose. Organisations and individuals may apply to have a manner of risk assessment or minimisation accredited by the RMA. Such manners may be for purposes other than those associated with the Risk Assessment Order or the Order for Lifelong Restriction. The application form is available here.